Mitch’s favorite MetroBus route is the #73 Carondelet, but he’s not a one and done kind of guy. There are a lot of other routes he likes to ride as well. The #73 Carondelet is Mitch’s main line of transportation, providing the frequency he enjoys and access to several scenic neighborhoods in the area, like Soulard, Cherokee Street, Dutchtown and Carondelet. “It’s my favorite route from an aesthetic point of view,” he said. After that, Mitch enjoys the #11 Chippewa route for its “straightforward” transit service, frequency and diverse passengers and conversation. Mitch has been a Metro passenger since 2013 and relies on its service to save money and avoid paying for parking. It also provides Mitch with a unique perspective of the region. “I love the city architecture from the vantage point of a MetroBus, especially the buildings in the south city area,” he said. His daily commute consists of catching the #73 Carondelet at the intersection of Cherokee and Ohio, or sometimes the #11 Chippewa at Cherokee and Jefferson, and riding the bus to Union Station. From there, he boards MetroLink and rides to the 8th & Pine MetroLink Station, where it’s just a short walk to his work just a few blocks away. Mitch also believes using public transportation is his civic responsibility. 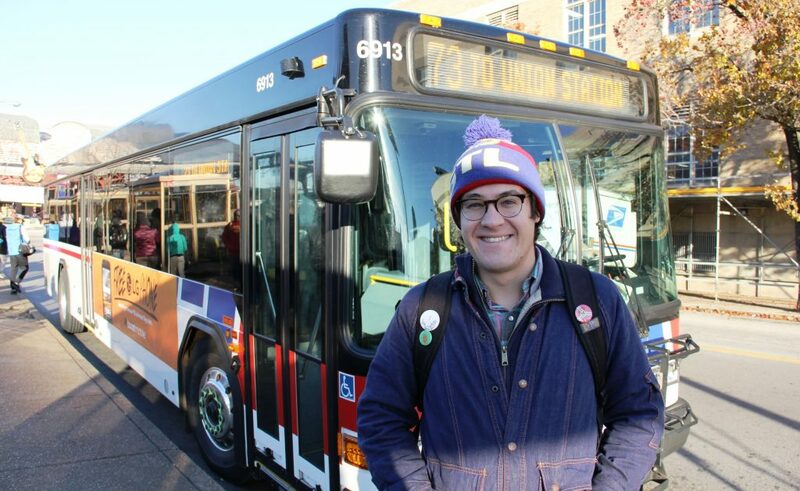 Mitch’s first MetroBus experience was on the #1 Gold Line when he was a student at Washington University. The route provided him with the perfect platform to learn the ins and outs of a bus commute. “It would shuttle me back and forth from campus to the Central West End and, on occasions, to Cecil Whittaker’s Pizza,” he said. In the end, Mitch uses Metro because it makes sense for his lifestyle and bolsters his civic pride.